If you're even just a casual word nerd probably know that the soda/pop line runs right through New York State. The fact that we share the state with the poppers in western New York is some sort sign that we can work anything out. The Canadian way of pronouncing "been" -- saying it like "set" -- has made a deep incursion into central New York. 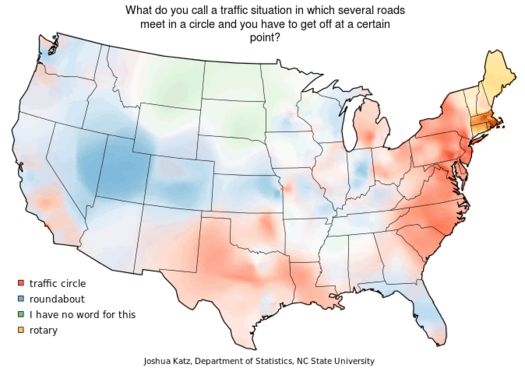 And the Capital Region holding it off from invading the East Coast: 50 percent of people here reported pronouncing been as in "sit" -- but almost 42 percent say it like "set." We're just being pulled apart by the word crayon. About 56 percent pronounce it "cray-ahn," 22 percent as "cray-awn" (as in dawn), and another 22 percent as "cran" (one syllable). Though a majority of people reported pronouncing the second syllable pajamas as in "jam," Capital Region is being squeezed by pronunciation as in "father," from the both the northeast east and southeast. We're split almost right down the middle on cauliflower -- half pronouncing the second syllable as in "sit," the other half as in "see" (common nationally only along the northeast coast). Basically no one can agree on how to say that name. There are bunch of other words and phrases you can explore on the map. It's some nerdy fun. Having earned my drivers license in the UK, I was taught there was a difference between a rotary and a roundabout. Basically the difference was size and what was in the middle, as well as the shape the road takes on the approach. Roundabouts were smaller intersections, often not much more than a 1' or so square post, maybe sunk into a paved mound about the size of a pitcher's mound, in the middle of an intersection that traffic had to go around. A 'rotary' or 'traffic circle' is a construction with a large area in the middle and the roads sweep in and out, much like, say, Latham Circle, where the center is either an underpass, grass, flowers, statuary, or other decoration. The dividing line seems to be somewhat technical according to wikipedia, but be aware that 'rotary', 'roundabout', 'modern roundabout', and 'traffic circle' are terms of art and, actually, not interchangeable. Would love to see the word "Saturday" in the mix. I've heard several people "from Albany" drop the T completely and replace the word "day" with "dee," creating a dreadful mush-mouth of "SAH-er-dee." What about how people upstate, especially in Albany, pronounce words ending in -tary as if it's TERRY? For example, they say doc-u-men-TERRY, with the accent on the last syllable, instead of doc-u-MENT-uh-ree. Commentary is the only word with the -tary suffix that's pronounced Common-TERRY. I moved up here from Long Island (I know, I'm sorry) and the pronunciation that always gets me is Aaron and Erin. People from around here tend to pronounce both as Eh-rin, instead of Ah-rin and Eh-rin. Drives me crazy. And doesn't help that I have friends with those names and never have any clue who we're talking about. I'm with Bob, I thought rotaries and roundabouts were different things based on scale. And according to my downstate-born husband, I, a capital district native, say rum instead of rOOm. But I don't hear it. Okay, I'll take the beating for not being able to pronounce a difference between Mary, merry, and marry (raised in earlier conversations about this, if not here). And for that matter, Aaron and Erin. I don't know what you're talking about. At the same time, I'm listening to someone from New England for whom "offers" and "office" rhyme perfectly. How can those possibly be the same sound?